Saint Bede qualified for the solar in schools grant for 2018. We have installed our panels now and they are assisting with the electricity use at the girl's boarding house. It will generate about $408 worth of electricity every year. 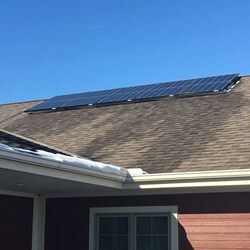 If you would like to see how all schools in illinois are doing with their solar panels you can check here http://www.illinoissolarschools.org/ On the solar school website they post yearly spreadsheets. This is so that anyone can see how much electricity different sized panels have produced at schools across illinois. If you are considering solar or wind, it's a great resource to actually see what you would be getting. To see how much our panels generated today, this week, month, or year. Click on the PV system overview on the top left of this screen! !